People in the community often describe the MakerBus in a number of different ways – saying we’re science educators, or tech evangelists, or even saying we’re a team of engineers. And while elements of these descriptions are true (yes we do science-y things, yes we use technology, and yes we have an engineer on our team), we feel that Adam Savage comes very close to describing our overall educational philosophy with that statement. We want people to learn something. Anything. And more often than not, we want people to learn everything. We think that learning works best when you cross disciplines. We know historians who are amazing computer programmers. We know engineers who are outstanding artists. The most creative people are the ones who break out of boxes and surpass boundaries. In a local context, London’s VibraFusion Labs is a fantastic example of cross discipline learning. This lab is filled with artists, musicians, inventors, and hackers who share their skills and passions to create technology that allows people with hearing and visual impairments to experience art. From chairs that use vibrations to convey music to devices that make sound tangible, VibraFusion Labs is a testament to what can happen when the arts and sciences work together. That brings us to STEM and STEAM education. For those who may not be familiar with those terms, STEM education refers to “Science, Technology, Engineering, and Mathematics” and STEAM refers to “Science, Technology, Engineering, Arts, and Mathematics.” The “A” in STEAM refers to the Liberal Arts, disciplines that range from history, to visual art, to literature, to philosophy. To be honest, we’ve never been completely comfortable with the term STEAM. While the term STEAM attempts to acknowledge the value of the “non-sciences” as ways of learning, the term treats the non-sciences as somewhat of an afterthought. With one letter, STEAM lumps everything that isn’t science, technology, engineering, or mathematics into the nebulous category of “Arts.” It largely ignores the social sciences (fields like anthropology, archaeology, and psychology to name a few) and ignores an entire range of hands-on skills (fields like plumbing, carpentry, gardening, etc). While the work being done at VibraFusion Labs could fit into the STEAM model since they’re applying technology to art, what about the work of other London-area groups like the Sustainable Archaeology project? At Sustainable Archaeology researchers are blending emerging technologies like 3D printing to archaeology preservation and curation. What role do the Social Sciences play in STEAM education? At the beginning of June the MakerBus held it’s yearly summer camp at the University of Victoria. At this camp we work to model a holistic educational model that values all forms of learning. We base this camp of the University of Alberta’s Philosophy for Children program. In this type of camp learners are asked to reflect and critically engage with “big ideas” throughout the day. 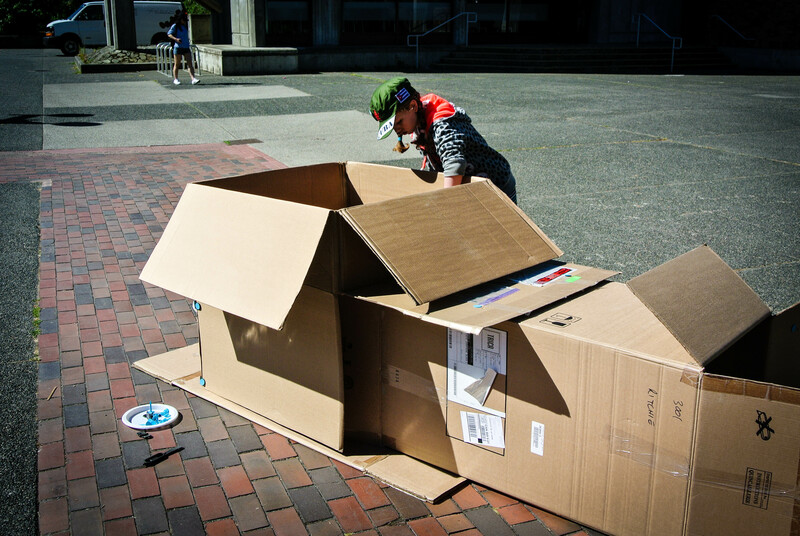 For example, one activity had students using cardboard and Make-do fasteners to build what they imagined would be everything a human needed to happily live in a zoo. At the end of the activity all of the students were brought together and asked to think about a question the activity inspired in them. As a group we discussed these questions. After this specific activity the students chose to discuss the ethics of eating meat. This activity went from a art task (designing a human zoo), to an engineering task (constructing a human zoo big enough for people in fit in), to a philosophical discussion. At the MakerBus it’s important that everything we do embodies this spirit of cross-disciplinary learning. We don’t want to simply teach people how to use 3D printers, we want to teach people how to use a 3D printer and then to have a discussion about the environmental impact of 3D printing. We don’t just want to teach people how to code, we want to teach people how to code in order to empower them to create art.